Sport bikes, sometimes called performance bikes or "crotch rockets," emphasize speed, acceleration, deceleration, and maneuverability. Because of this, there are certain design elements that most motorcycles of this type will share. Sport bikes have comparatively high performance engines resting inside a lightweight frame. The combination of these help maintain structural integrity and chassis rigidity. The Monster (informally called Il Mostro in Italian) is a motorcycle designed by Miguel Angel Galluzzi and produced by Ducati Motor Holdings in Bologna, Italy since 1993. It is of the naked bike style, which is characterized by a sport bike with a fully exposed engine and frame. Here it is, the reigning King of the Superbikes. Ducati's 996 and its predecessors have won the World Superbike Championship so many times, we've lost count. In 2001, Ducati expanded its Superbike range with the type 996R. The sporting character of this 2-cylinder bike is enhanced by the single seater (Monoposto) layout. The ZX-9R was a sport bike manufactured by the motorcycle division of Kawasaki Heavy Industries of Japan from 1994 to 2003. There were five model incarnations across two basic designs. The Ducati Desmosedici is a four-cylinder, 16-valve engine MotoGP racing motorcycle. Ducati abandoned the Grand Prix racing scene at the start of the 1970s. 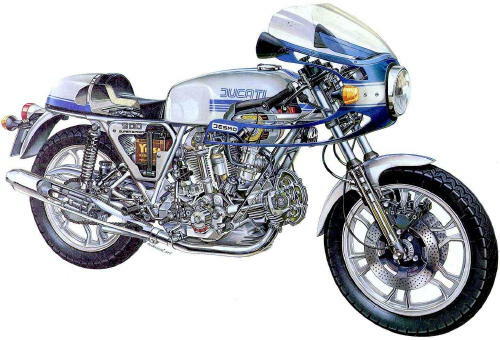 For many years the 500 class was essentially a class for two-stroke bikes, an engineering technology that was far removed from the four-stroke road-going machines sold by Ducati. The Triumph Bonneville was first produced in 1959 and remained on the market in different variants up to 1988. The high-performance, twin-carburetor fed version of the 650cc engine was derived from the existing Triumph T110 Tiger. Its maximum power of 46bhp was sufficient for a top speed of over 110mph. The Rocket III is the biggest production motorcycle built in years. It is also the first production motorcycle to break the 2-liter barrier, hence its aptly named moniker. The Rocket III is not just another motorcycle; it's the ride of a lifetime. Born in 1976 the XT500 was the first “big thumper” made in Japan, it was a daring bet for Yamaha, but the XT500 with his charism, his torquey engine solid as a rock (strengthens by his success in Paris Dakar rally), began quickly to be a world top seller. Triumph began in 1883 when Siegfried Bettmann emigrated to Coventry in England from Nuremberg, part of the German Empire. In 1884, Bettmann, aged 20, founded his own company, the S. Bettmann & Co. Import Export Agency, in London. Honda developed the CB1100R as a race bike, for street legal racing series in various countries like the United Kingdom, Australia and South Africa. To be able to use such a bike in such classes Honda had to produce a minimum amount of bikes (500) and it has been updated quite a few times to meet the requirements as rules changed. The first XT500 was shown at the US dealer convention in September 1975. Europeans had to wait till the summer of 1976 before they could press their boots against the heavy kick-starter. The XT 500 was an instant success and was produced until 1990. It laid the ground for the later range of XT bikes ranging from 125 cc (XT 125) to 750 (XTZ 750) and contributed largely to Yamaha's image. The Ducati SuperSport and SS are names applied to a series of Pantah based air-cooled four stroke two valve V-Twin motorcycles manufactured from 1988 onwards. A limited edition SuperSport called the SuperLight was sold in 1992. The RD350 was a motorcycle produced by Yamaha. It was the premier sport lightweight of the early 70's and was evolved from the piston port (pre-reed valve intake tract), front drum-braked, 5 speed Yamaha 350 cc "R5".